Tonight DH and I celebrated our 5 year wedding anniversary. I can't believe how quickly time has passed! We went to a restaurant by Roy Choi that was featured on the new Anthony Bourdain show and on Top Chef, and I have to admit I wasn't very impressed. My chicken was really dry and the sauces didn't seem to compliment the food. On the upside, seating was community style and we sat next to a couple that didn't live far from us. We had a great conversation throughout dinner with them. Roy Choi popped into the restaurant while we were dining, and it was sort of a treat to see a semi-celebrity. The other day when I was hunting for the LA Girls, I ran across the new Sinful Shine display. I wasn't overly impressed with the color selection because they seemed very similar to the standard Sinful Color polishes. There were mostly creams but there was a stunning forest green glassfleck that popped out at me. I came home with Amazonian, and while swatching it, I saw yellow flecks in it too. But does the $2.99 bottle live up to the claim of having a super gel like shine to it once dry? Almost! It's definitely shinier than most polishes, but it's still not quite a gel like shine. Is it worth the $2.99? I think so. These pics are two coats of Amazonian with no topcoat. I finally unearthed my missing bottle of Essie Matte About You during my reorganization of my stash, so I used this opportunity to use it. 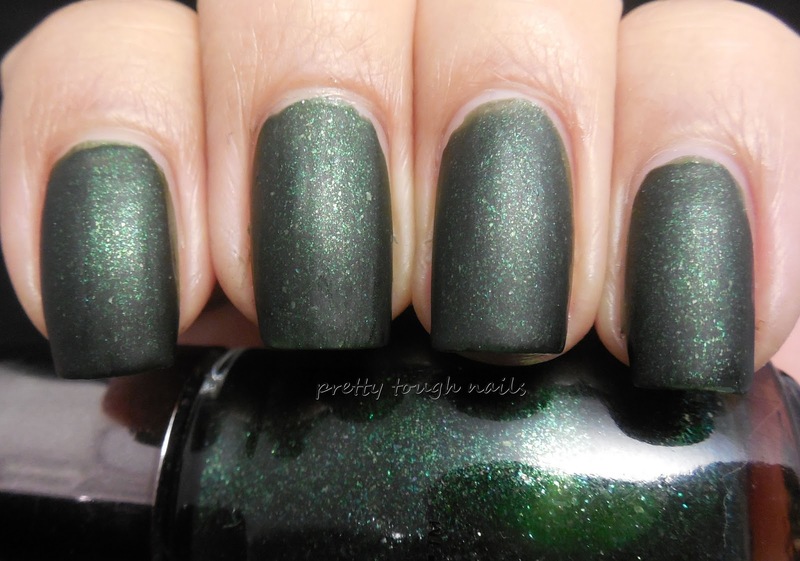 I love how the green changes after the matte topcoat. I think after trying out this shade, I want to go and pick up some more but I'll probably wait until they go on sale. The shiny finish is great but for me, I'd probably still use a quick drying topcoat because I'm impatient and I always ding my nails. Have you tried these yet, and if so, how do you like the shine? This is really pretty! I love it as a matte. I love matte-fying polishes like these! So glad I found the matte top coat.